So, you found that your garage door is making all that ruckus, but are not really concerned because it’s still working. But even if the noises that it’s making doesn’t bother you, you should know that there’s a high chance that your garage door would eventually malfunction and stop working. But should you really be concerned? Learn the common noises garage doors make and discover what they mean. If your garage door opener is electric and are hearing loud booming noises when opening or closing the garage door, it’s having difficulty lowering and raising itself, explains an experienced garage door technician in Utah. The most common cause of this issue is a damaged torsion spring. To determine if the torsion spring is the culprit, inspect the door when it’s closed and check if one of the torsion springs might be damaged or completely broken. If so, it’s important to have it checked and repaired before your garage door becomes a safety hazard. If you hear a noise that’s similar to a chain that’s stuck in the garage door, you might have an issue with the electric opener’s belt or chain. It might be that your electric opener is skipping some links due to damage or the belt is just loose. These issues could easily be resolved with a simple adjustment. Do note, though, that you shouldn’t attempt to do the adjustment yourself to avoid damaging the electric opener further. You could be facing many different problems if you hear your garage door making noises similar to animals squeaking. It could be that the in-between sections of your door and the exterior frame need to be lubricated because these parts dry out over time and stick together. Your garage door might need to be realigned if you’re hearing really loud squeaking. Inspect the door’s alignment and try to see if there’s irregular movement. 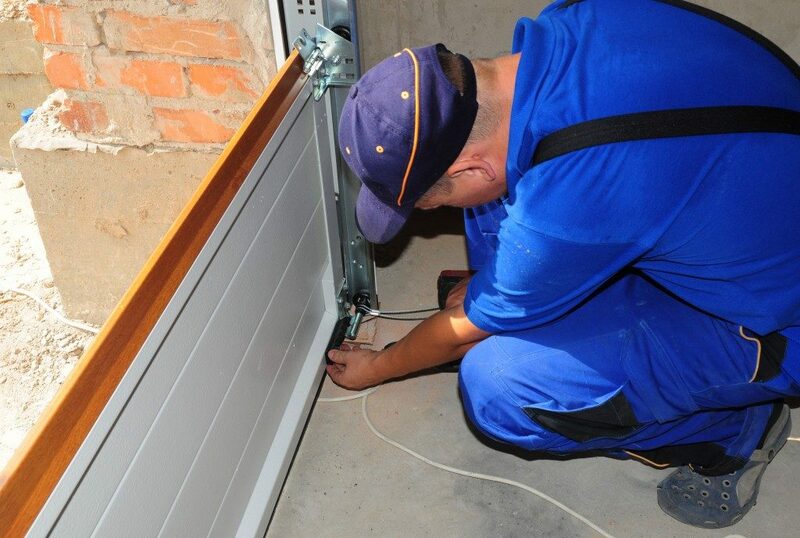 If you find that the door is misaligned, call a technician right away to realign it for you. If you hear clinking noises when lowering or raising your garage door, it’s probably due to a problem with the torsion springs. The clinking is from the springs’ coils rubbing against each other. This is especially true if you have an older garage door that’s getting rusty. Have a technician do routine maintenance on your garage door to address this issue. Fixing small problems can help you avoid bigger and costlier issues in the future. Depending on what’s causing your garage door to make noise, you might need to get the problem resolved as soon as possible, especially if it presents a safety risk. It is also important to keep in mind that garage door repair is a complicated and dangerous task that’s best left to professionals; so, while you could freely inspect your garage door for issues, do not try to repair it on your own. Choose a professional based on experience, customer reviews, or recommendations from your friends, family, or colleagues.